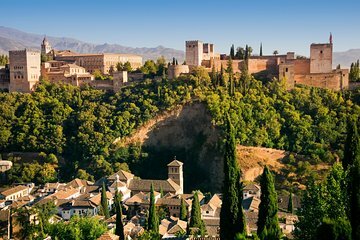 Located at the foot of the Sierra Nevada mountain range, Granada lies at the heart of Andalucia, which, for centuries, was ruled by the Moors. Dripping in history and with an intoxicating mix of cultures represented in the city’s ancient streets, you can be bathing in the spectacular Islamic architecture one minute, exploring a Catholic monastery the next, and later on, be watching a gypsy Flamenco show. A beautiful place full of fine old buildings and twisting cobbled streets, exploring Granada is a magical experience. There are a number of great spots that offer breathtaking views over the city. The undoubted highlight is, of course, the Alhambra which was the last Moorish stronghold in Europe. 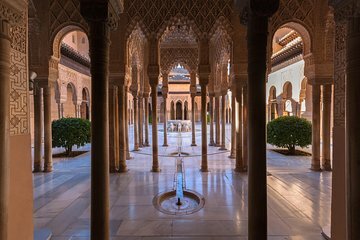 With its intricate designs, beautiful carvings, and spectacular architecture it reflects the highlight of Moorish civilization in Andalusia. With so much to see and do in Granada, visitors will never leave disappointed. 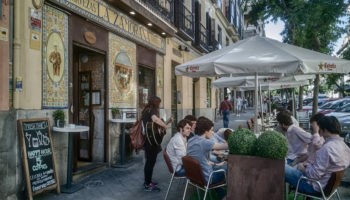 With loads of great bars, restaurants, and cafes, social life in Granada revolves around Plaza Bib-Rambla; it is the perfect place to head if you’re looking for something to eat or drink. Surrounded by fine 19th century buildings, a lovely fountain occupies the center of the square and leafy trees provide locals and tourists alike with some much-needed shade. 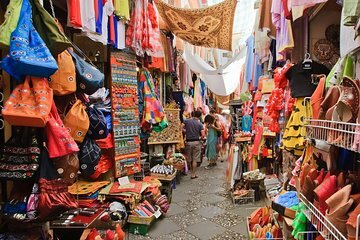 With lots of shops and markets nearby, you’ll inevitably end up at Plaza Bib-Rambla at some point during your trip to Granada. If you are looking for a peaceful place to escape from the crowds, Carmen de los Martires is the perfect spot; it is remarkably quiet and secluded, despite lying right next to the Alhambra. The gardens date to the nineteenth century and have a blend of English, French and Moorish-style elements. Full of trees, plants, flowers, and ponds, it is delightful to wander around. At its heart, there is a lovely little tower that provides great views over the surrounding gardens and Granada itself. With a number of shady spots to escape the glaring sun, this leafy spot is a hidden paradise that is just waiting to be discovered. The first Catholic monastery to be established in the city, construction began in 1496 and San Jeronimo is now visually stunning to behold. A beautiful Renaissance building, both its interior and exterior are marvelous to gaze upon. There are some fine decorations on show, with the undoubted highlight being the enormous altarpiece in the church. Currently home to a community of sisters, there is a delightful little courtyard and garden for you to wander around that lies beneath the monastery’s towering walls. Lying just 15 minutes from the historic center of Granada, the Science Park is a captivating place to visit and you’ll definitely come away having learned a lot. Split into two main parts, the first exhibition offers up an enchanting and entertaining look at some of the achievements of Islamic scientists from Andalucia; you also go on a journey around the human body and how it functions. In contrast, Foucault’s Pendulum Building looks at various scientific fields, with physics and chemistry featuring prominently. In addition to this, the Planetarium is also worth visiting for the magical shows that it puts on. 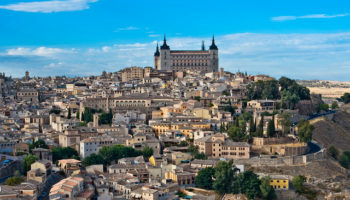 Offering breathtaking views of both Alhambra and the Darro River, Sacromonte is also the area to head to if you are interested in gypsy or Roma culture. A traditional neighborhood, it is here that gypsies lived in caves for centuries to preserve their rich cultural heritage. It certainly worked. In Sacromonte, you can hear some of the finest Flamenco around and also watch Zambra that originated in the area. The whitewashed buildings are very distinctive and stand out against the hillside, and the Museum of Sacramonte is definitely worth visiting if you’d like to learn about the local culture and history. Possibly the prettiest street in the city, the scenery that surrounds Carrera del Darro makes it delightful to walk along, as it winds its way alongside the Darro River. With lots of old Renaissance and Moorish buildings lining the street and beautiful flowers and trees scattered about, it really is as romantic as it sounds. The ancient stone bridges that cross the river here and there only add to the perfect image. It is here that funeral processions used to take place, which indicates why it is called ‘the walk of the sad ones’. Located in between Alhambra and Albayzin, you will be anything but sad when taking in all of the stunning scenery. At the end of Carrera del Darro, is Paseo de los Tristes, a plaza that was once on the busiest gathering spots in Granada and is now a popular place to eat. Once a Roman Cemetery, this Carthusian monastery is a delightful slice of Baroque architecture and certainly paints an imposing image amongst the green grass surrounding it. 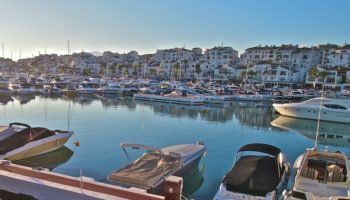 As it lies away from the main body of tourist attractions in the center of Granada, it is often overlooked by visitors, although it definitely has a lot to offer. Two of the main highlights are the monastery’s church, which has some lovely paintings and statues on display, and the brilliant sacristy, covered in marble, paintings, and sculptures. Built between 1737 and 1759, this opulent and awe-inspiring basilica is definitely worth a visit when you’re in Granada, due to its splendid, gold-coated interior. Plastered in sparkling gold and shiny silver, the wealth on show is spellbinding – if a little over the top – and there are some fantastic frescoes that cover the walls. Positively gleaming in the light, it is extraordinary; one of the highlights is the golden altar. While the Baroque exterior is noteworthy for its fine design and sculptures, Basilica San Juan de Dios’ interior is what people really come for. The old Arab part of the city, Albayzin is a captivating place to explore. It is littered with tiny winding streets that snake their way between the old buildings, shops, and restaurants. The oldest quarter in Granada has a number of small plazas for you to relax in and there are lots of traditional Andalucian houses in the neighborhood. As Albayzin is situated on a steep hillside, there are a lot of steps to navigate, although it is certainly worth clambering to the top for the fantastic views of Alhambra. Lying at the heart of the old town, Granada Cathedral is an imposing building due to its massive facade that looms over the square before it. Built on top of a mosque that was once in the same location, the cathedral is the second largest in the country; work began on it all the way back in 1518. With Renaissance, Gothic and Baroque elements incorporated into its design, it is impressive to behold. 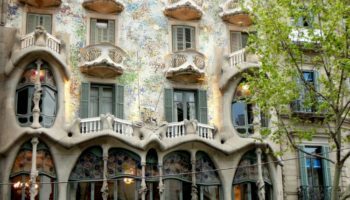 Five different architects contributed to its style as it took over 180 years to finish. The inside is equally spectacular, with stained glass windows, sculptures and El Greco paintings lining its walls. There are 13 distinct chapels which are dedicated to different saints. Offering marvelous views of both Alhambra and the Sierra Nevada mountain range, Mirador de San Nicolas is worth climbing up to. If a 45-minute walk isn’t your cup of tea, you can always take the bus to the top of the hill. Passing through the Albayzin (the old Arab part of the city) is lovely in itself. The viewpoint is situated in Plaza de San Nicolas, which has a church of the same name in it. Looking out across the valley, you can see Alhambra imperiously perched atop a hill which is coated in trees. The earthy colors of the walls stand out delightfully against the verdant green of the woods below. Off in the distance, the Sierra Nevada Mountains only add to the breathtaking scenery. 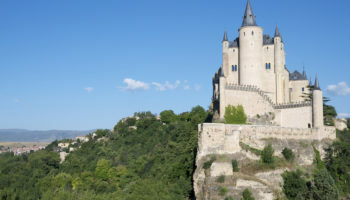 Coupled with Alhambra, they make the Mirador the perfect place to hang out and enjoy the view. With lots of restaurants surrounding the viewpoint and local musicians lighting up the area with their atmospheric music, the Mirador de San Nicolas is a must-see when in Granada. Located inside the Alhambra, the Palace of Charles V was commissioned by the Holy Roman Emperor himself, partly as a tribute to his grandparents Ferdinand and Isabella, who ended Moorish rule in Granada and took back the city for the Christians in 1492. A magnificent Renaissance building, at the heart of the palace is a wonderful circular courtyard that is lined with colonnades. Home to the Museum of Fine Arts, the palace houses over 2000 artworks, including a number of fine religious paintings and sculptures. It is well worth a visit for the wealth of amazing art pieces that there are to see. The oldest part of Alhambra, Alcazaba dates back to the 13th century when it acted as a military citadel. Occupying a prominent hilltop, it was from here that the Moorish rulers could watch out over their territory, protected from any invaders by the huge walls around them. Nowadays, you can wander around the old ramparts, look at the foundations of ancient buildings, and marvel at the sheer size and magnitude of it all. The Alcazaba tower is definitely worth ascending to witness the fantastic views over Granada and the nearby Sierra Nevada Mountains. Lying at the heart of Alhambra, the Palacios Nazaries are a masterpiece of Islamic architecture. You’ll want to take your time exploring the complex due to the sheer wealth of intricate designs, inscriptions, and details that cover the buildings. Made up of the Mexuar, the Palacio Comares, and the Palacio de los Leones, this part of Alhambra is simply divine and is well worth the entrance fee. Wandering around the rooms is a magical experience, as incredible carvings coat the rooms, beautiful pillars seem to drip from the ceilings and elegant courtyards, pools, patios, fountains and more only add to the extravaganza on show. Dripping in symbolism, various designs and art pieces depict the cosmos and heavens, while marble statues line the palaces of the Moorish rulers. Everything here is covered in complex Islamic geometric designs and the thought put into it all is as impressive as the ingenuity of the craftsmanship itself. Magical. Simply stunning, the Generalife is undoubtedly the highlight of what Granada and Alhambra have to offer. The former summer palace and residence of the Nasrid rulers, it is here that the sultans came to spend the long, hot Andalusian summers and it is easy to see why. While the architecture – which features a number of delightful archways – is indeed exquisite, it is the lush and beautifully manicured gardens that are the main attraction. Perfectly landscaped, roses and elms line the walkways and fountains joyfully shoot up from amidst the plethora of plants. Wonderful to walk around, Generalife also provides some fantastic views of Albaicin in the old part of the city. 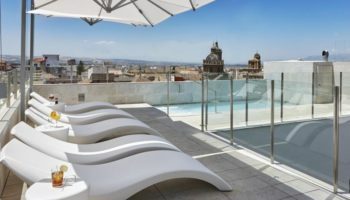 Simply a must-see when visiting Granada, this sumptuous palace with its elegant gardens and delightful fountains will entice and astound you as it did the sultans of old.